The British newspaper The Guardian is reporting that a new photograph of Robert Johnson has been authenticated. The photo shows him with longtime traveling companion Johnny Shines. The two known photos of Johnson, one which showed him with a cigarette in his mouth (which the U. S. Postal Service erased when they used it for a commemorative stamp! ), and the other showing him in a pin-striped suit (used on the cover of the CD reissue Robert Johnson: The Complete Recordings, came after many false alarms and photos that proved not to be Johnson. The late David “Honeyboy” Edwards, who knew Johnson well, was called on several times to inspect supposed pictures of Johnson that turned out not to be such. A film clip that at one time was believed to show Johnson was examined and determined to have been made after Johnson’s death. The classic reissue LPs of Johnson, King Of The Delta Blues Singers and King Of The Delta Blues Singers, Volume 2, both relied on artwork to represent the bluesman without an actual picture. Not everyone is convinced that this newly authenticated picture is Johnson, and there will no doubt be some debate about it, as there always is with all things pertaining to Robert Johnson. 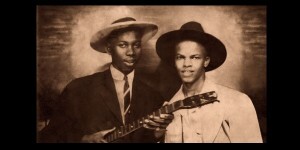 note: author Elijah Wald (“Escaping The Delta: Robert Johnson and the Invention of the Blues”) says this photo isn’t of Johnson and Shines and that the late Honeyboy Edwards had seen it and indicated that.